Summary: We've been excited to get our hands on the Conscious Cleanse book ever since we heard about it. The cleanse isn't the kind you may be used to, where you feel deprived, and end up hungry and miserable. What it does do is take certain foods out of your diet that you may not even realize you are reacting to, so that you have a full picture as to how your body reacts to those foods. 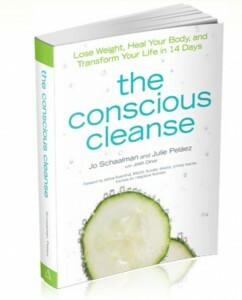 We’ve been excited to get our hands on the Conscious Cleanse book ever since we heard about it. The Conscious Cleanse isn’t the kind you may be used to, where you feel deprived, and end up hungry and miserable. What it does do is take certain foods out of your diet that you may not even realize you are reacting to, so that you have a full picture as to how your body reacts to those foods. Forbidden foods on the list may surprise you, such as oranges, strawberries and tomatoes. Many people react to foods like these without even realizing it. The good news is that there are a ton of options on the foods that are allowed. Before you start thinking that this is going to be a book that just tells you what you can and can’t eat, worry not – it is so much more than that. The Conscious Cleanse gives you a rounded way to take care of yourself in every way, body and mind. It is a commitment to build up to slow change, and includes ways to slowly remove foods and beverages from your diet, rather than shock your system. Full disclosure, we were a little daunted at the thought of giving up caffeine while on the cleanse, but we transitioned slowly off of it. We were surprised at the difference we saw just from reducing caffeine: *more* energy, more calm, less stress and less stress eating. Here is a recipe that is the perfect example of the delicious dishes that fit within the cleanse. Blend all ingredients in a food processor. Serve immediately with carrot sticks. Get your own copy of the Conscious Cleanse, and let us know what you think!